Indian restaurant madras curry is one of the great ones. 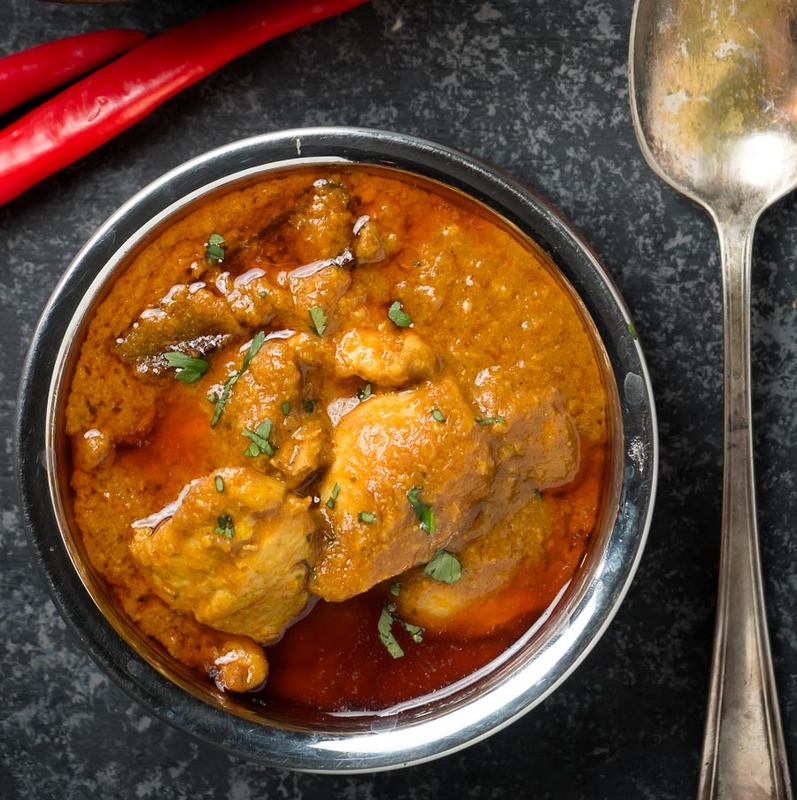 Madras curry is on every single restaurant menu for a reason. It’s absolutely delicious. It’s on the hotter end of the scale. A spicy curry. It can even be a really spicy curry. Some restaurants go a little overboard I find. I like blazing hot madras curry. But not everybody does. So this version isn’t so hot – medium spicy really. That’s the nice thing about cooking it yourself. You control the heat. Like it blazing hot? Add more kashmiri chili powder or use one the hotter Indian chili powders. Want your kids to eat it? Roll the kashmiri chili back a bit. It’s up to you. 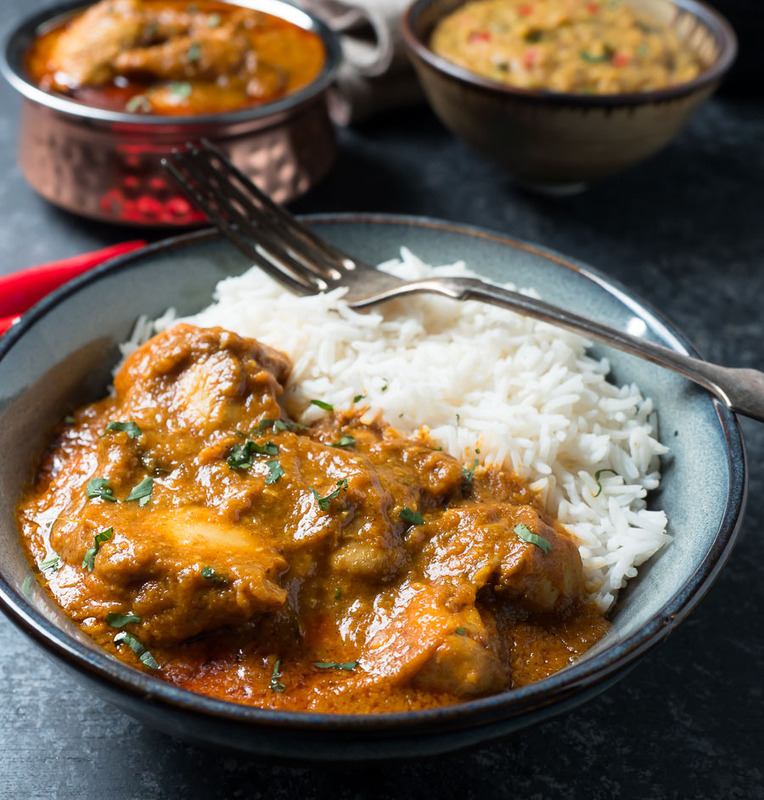 This madras curry is done in the restaurant style. Like you get when you eat out. Pretty much exactly. It’s all about the prep. Cooking it takes 10 minutes. Restaurants don’t have big pots of curry sitting around hoping somebody will come and order it. They cook to order. It’s totally different from home style cooking. Homestyle is about low and long braises. Restaurant style is about speed and efficiency. But with lots of flavour. Curry base is a game changer. It’s the way they do it. The foundation of Indian restaurant style cooking. Amazing stuff. Indian curries generally rely on caramelized onions. That’s what makes them what they are. You need to get that into your dish. And curry base is how restaurants do it. For madras curry. For pretty much all curries. There’s not much to curry base. It’s basically a whole lot of boiled onions with some flavouring. Tastes like a weak onion curry soup. Bland. You’d never guess that something so bland can become so good. That’s where the technique comes in. The key to making this work is heat. High heat. At the right time. When the curry base hits the pan you want it caramelize. Fast. It’s a balancing act. The oil can’t be too hot when you bloom the spices. They will burn. Medium heat. Garlic ginger paste goes in next. Tomato after that. Once you have some wet ingredients in your pan your spices are safe. That’s when you crank it. High heat. Curry base goes in a bit at a time. You don’t want to cool your pan down too much. Maybe half a ladle at first. Then a full ladle. Then the rest. Somehow it works if you do that. There’s a post that covers the technique and the ingredients you need here. Do yourself a favour. Read it. It will help you understand what you are trying to do. The recipe below does cover madras curry accurately. If you’ve made a few curries in this style you should have no problem. But if you are just getting started read the guide. It makes things so much easier. Do your prep before you get started. Make your curry base and have some heated and ready to go. Pre-cook your meat. Measure out your ingredients. Have everything at hand. 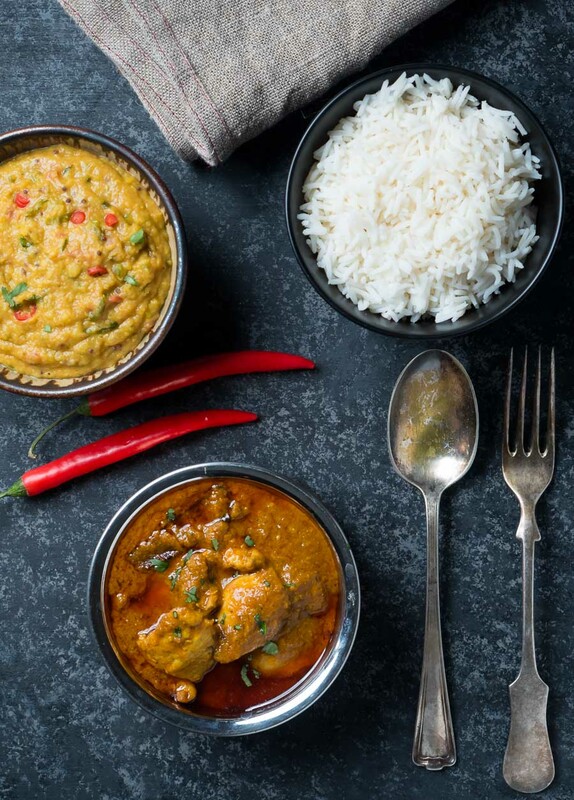 Put on some old clothes – making restaurant curries is messy stuff. Almost all the restaurant style curries on glebekitchen can be made how you like. This is a chicken madras. But you can make it with lamb or beef just as easily. You can even make it with chickpeas or masoor dal for a vegetarian option. Chicken madras is my favourite but lamb is a close second. And a madras curried dal is third. That’s me. You can do what you want. Make this your madras curry. Whatever you want. Just make it. 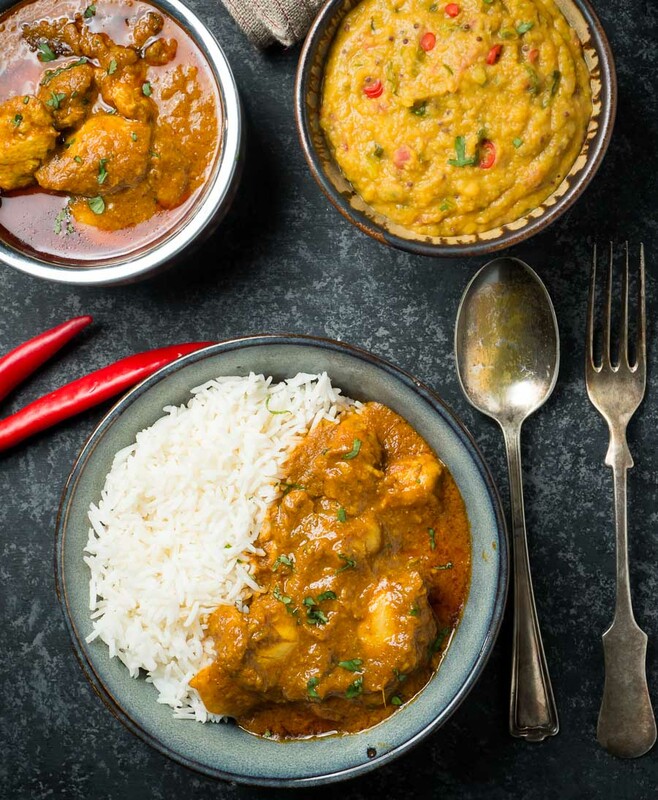 Madras curry is a spicy dish that’s sure to please. At the top of my list. If you are a fan this is for you. If you haven’t tried it before now is the time. 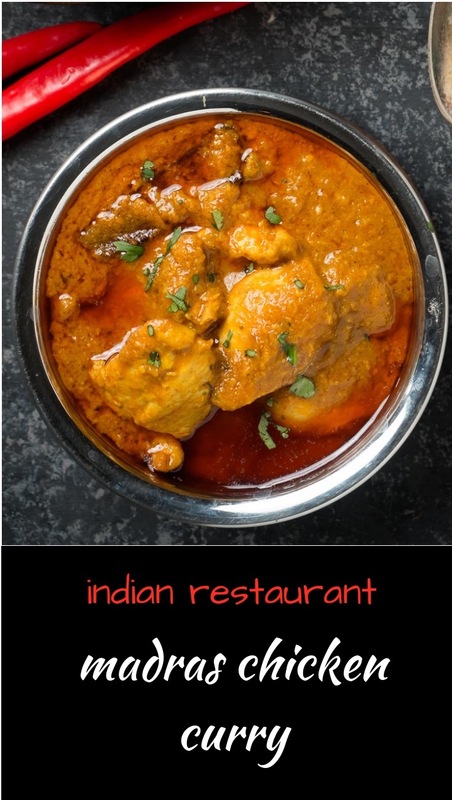 Indian restaurant madras curry is a classic dish on the menu of just about every Indian restaurant out there. Now it can be on your menu too. Dilute your coconut milk powder enough with water to get it to the consistency of coconut milk. When the oil starts to shimmer add the cinnamon stick. Toss is around the pan for about 15 seconds until bubbles start to form around it. It may crackle a bit. Add the onions and stir constantly until the edges of the onions start to brown. This takes about a minute. Add the rest of the curry base and let cook until the bubbles form. Add the lemon and diluted coconut milk powder. Turn the heat down to low and add the pre-cooked lamb, beef or chicken. Honestly… I love my curry on fire!! Unfortunately, the hubbs does not. I seriously might have to divide my curry in two, just so that I can bring the heat in mine . . .
Why is that you recommend not using a non-stick pan, out of curiosity??? 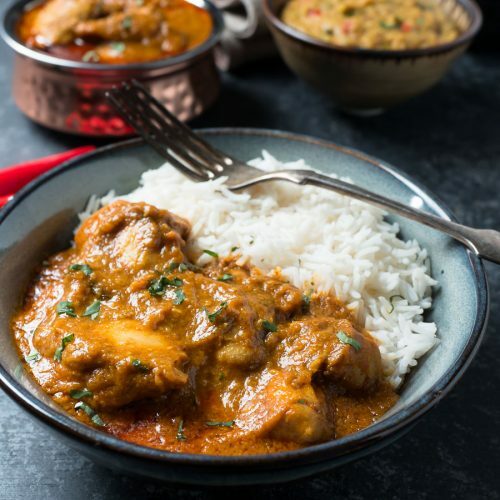 Restaurant style curry relies on the caramelization of the curry base over high heat. A non-stick pan doesn’t let the base stick and caramelize properly. Also, you can’t divide the recipe. That doesn’t work. And you can’t make double either. You won’t get the caramelization to work. This is really one of those techniques that really has to be followed exactly for it to work. Not unlike baking in that respect. Oh that’s brings up another question! Sometimes, you know my caramelization turns to stuck on burnt. 😛 Flavour nonetheless! but do you recommend I find a way to ‘deglaze’ that? A bit stuck on is what you are going for. A little bit of sticking at the edge so you can scrape it up with your spoon. If you go too far though, just leave it in the pan. You don’t want the burnt taste in your curry. You must have the BEST leftovers every night! Thanks for sharing this deliciousness! Haha – my coworkers can attest to the quality of my lunches! You can do it! The prep part sets you up for success. Hi, I would love to try this for a dinner party tomorrow night. Im cooking for 6 people, can I just triple the recipe? Thanks! Would it be ok to triple this recipe for 6 people? thanks! Made this tonight was a winner. Absolutely loved it. Who needs take away. Next is the vindaloo. I almost never get take away Indian any more. Once you figure out how to make it at home it’s so much better!